If I could only show one franchise to people to explain the cinematic potential of video games it would be Sony and Naughty Dog’s “Uncharted” series. “Bioshock,” “The Witcher,” and “Mass Effect” would be high on the list as well, and neophytes should spend some time with the behemoth that is “Call of Duty” just to experience what that is like firsthand. But the one series that has consistently reminded me of the same visceral thrill that I remember experiencing in darkened multiplex theaters when I was kid is the adventures of Nathan Drake in “Uncharted,” through four standalone games and now in a new spin-off called “Uncharted: The Lost Legacy.” These games recall generations of storytelling, in literature and cinema, echoing both “Raiders of the Lost Ark” and the serial films that inspired it. As the series has progressed to the current generation of consoles, the visual language of the games has gotten even more cinematic and beautifully composed. They are games that put you in control of a blockbuster film, allowing you to step into the role of an action hero in ways that other franchises can’t come close to replicating. There’s a palpable sense of adventure in these games, and a perfect blend of authorship and storytelling in that you feel simultaneously like you are watching a fascinating story unfold and being an active participant. Last year’s Game of the Year for me personally was “Uncharted 4: A Thief’s End,” a brilliant capper to the Nathan Drake saga and as entertaining an experience as you can have with a controller in your hand. It’s an ambitious, gorgeous game that everyone with a PS4 should play. After its release, the team started to develop story DLC (downloadable content)—a chapter or two of gameplay for fans to download and continue the adventure—but it turned into its own standalone experience, now available under the title “The Lost Legacy,” exclusively for the PS4. The final result is somewhere between the 1-2 hour standard running time for campaign DLC and the more epic experience of “A Thief’s End,” and Sony reflected that with a lower price point than average ($40 as opposed to the standard $60). Still, there’s a sense that this is not “Uncharted 5,” and the “spin-off” aspect of the game is almost unavoidably detrimental to the overall experience. And, while this game is gorgeous and I’ll get to its strengths, there’s a sense in the actual gameplay and storytelling that this is a minor version of a major game—the story is less involved, there are fewer settings, the combat feels more repetitive, etc. Now, everything here works, and some of the imagery is as gorgeous as anything in the “Uncharted” franchise, but it’s essentially more of an appetizer or dessert than a full meal just by its very structure. But damn is it a tasty dessert. For the first time in the series, you don’t start out playing Nathan Drake, treasure hunter extraordinaire. And that’s a major development for this series, perhaps indicating that we can expect future full “Uncharted” games without Drake as the protagonist. You play the tough-and-smart Chloe Frazer, who we met first back in the stellar “Uncharted 2: Among Thieves.” Voiced and mo-capped by Claudia Black, Frazer is a fantastic leading lady, a darker and even tougher version of Drake. She’s more likely to be ruthless to get what she needs, and someone who knows that all too well is Nadine Ross, a major character from “Uncharted 4: A Thief’s End.” An antagonist throughout much of that game, she joins Chloe as a somewhat-morally-gray protagonist in this installment. You're Chloe, but Nadine is by your side through much of the game. 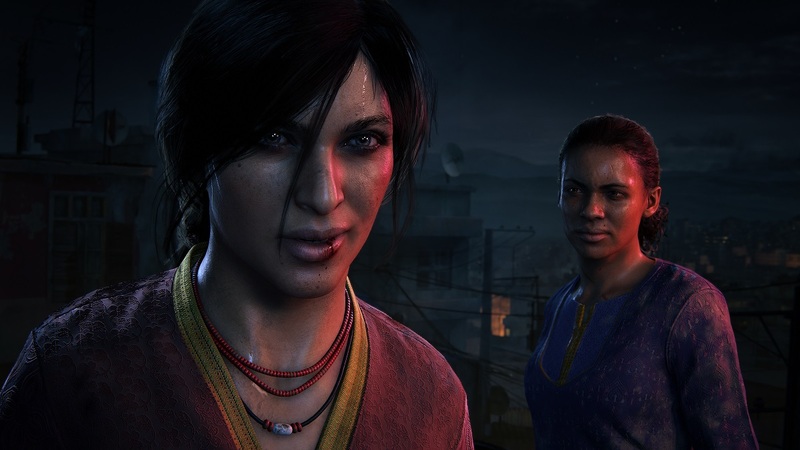 The bulk of “The Lost Legacy”—after a fantastic opening sequence in an Indian city—takes place in the Western Ghats of the country, where Chloe and Nadine are seeking a legendary tusk. The map they steal from an expert leads them on a series of hunts to essentially find keys to where the tusk has been hidden for generations. Along the way, Chloe and Nadine have to fend off attacks from an insurgent group led by the villainous Asav, and a familiar face may or may not pop up along the way. I wouldn’t dare spoil. That last sentence is indicative of the rich storytelling in these games, experiences that could easily work as novels and will likely someday fall apart as feature films. 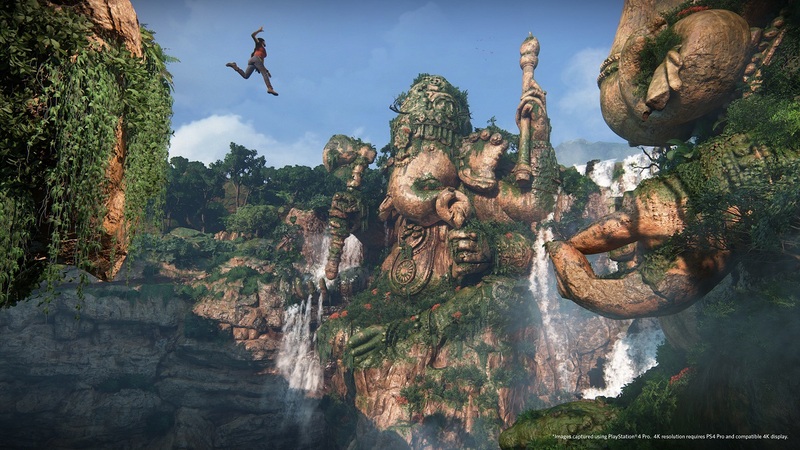 With a balance of action and plot development that rivals our best blockbuster filmmakers, the “Uncharted” have a perfect rhythm, punctuating minor gameplay sequences with major set pieces. There’s a helicopter scene relatively late in “The Lost Legacy” that ranks with the best in the franchise and it's quickly followed by an even-better bit on a moving train. The center of “Lost Legacy” gets a bit repetitive but the opening and closing hours are stunningly enjoyable, up there with anything this franchise has produced. A lot of the success of the “Uncharted” games comes down to balance. You don’t really do the same thing for too long for it to get boring. You’ll be climbing mountainsides then solving ancient puzzles then engaging in a shootout and then the cycle starts again. However, the developers break up even the potential monotony within that structure with major sequences and even morally gray character development. Chloe Frazer has the kind of narrative arc that Hollywood actresses would kill to play. And the supporting roles of Nadine and [SPOILER REDACTED] are nearly as well developed. Then there are the visuals. There’s a depth of field and attention to detail in the graphics here that’s breathtaking. As you reach a new peak and a new horizon expands out in front of you, the detailed look of the game is unlike anything else currently on the market. Again, it recalls ‘80s blockbusters like the kind Spielberg used to make in the way it blends the wonder of exploration with the adrenalin of action. And there’s a notable way the visuals in these games play with height. As you swing from mountain top to mountain top—you have a rope that saves your life roughly two dozen times—you can almost feel the actual height of the peak and the wind in your hair. “Uncharted 4” was one of the best-looking games in history—not purely because of realism and detail in the graphics but how those graphic capabilities were used to enhance storytelling. The model and success rate is the same here. I wish “Lost Legacy” had a bit more variety in its visuals but the one place where you do spend the majority of the game has hours of beauty to show you.